With this installment, I used up the last bit of our precious home-made pumpkin purée stored in the freezer. The series closed with a golden key, by the way. This curry is a winner! Pumpkin & shrimp is actually a very traditional combination in the Brazilian dish called “camarão na moranga”. You can see a photo of the completed dish here. Think about a shrimp stew served inside a small pumpkin, carved to hold the stew in all its tasty glory. I intend to make the Brazilian version sometime, but for now I’ll share this variation that I adapted from Bon Appetit magazine. Heat olive oil in a large saucepan over medium heat. Add the diced shallot and ginger; lower the heat and sauté until soft, stirring often, about 8 minutes. Add garlic; cook for 1 minute. Stir in the tomatoes and pumpkin puree, and cook on medium-high heat, stirring frequently, until the pumpkin is golden brown, about 10 minutes. Add vegetable broth, coconut milk, curry powder, and cayenne pepper; simmer gently for 20 minutes. Add peas, shrimp, and lime juice. 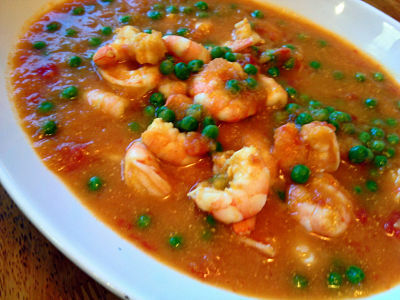 Simmer until shrimp are cooked and peas are warm. Serve with steamed rice. Top with cilantro, and lime zest. What a delightful prawn recipe! Methinks I shall make when I can cook my own pumpkin puree which would taste so much more real! This looks great! I wonder how it would be with some other type of squash, like butternut or acorn? I love my immersion blender and use it all the time. It’s so much easier than having to put hot liquid into a food processor or counter-top blender. I’ve read some horror stories about people mangling their hands while using one, but I don’t quite see how that happens, do you? http://www.nytimes.com/2013/01/16/dining/immersion-blenders-can-be-a-danger-in-disguise.html?smid=pl-share It would not occur to me to try to pry food out of the blade without first unplugging the device! Anyway, be careful in the kitchen, folks! I have my share of scars from knives, but that’s another story. This is a wonderful recipe. But thank you for freezing stuff like pumpkin puree!!! It’s so versatile!!! I keep everything!!! Which is also why my husband gets bummed when I can’t recreate a recipe for him because I used leftover this and that!!!! But it’s so smart! Wow, what a brilliant idea to add pumpkin puree to the mix. Luxurious and rich! Very luxurious indeed, and without any cream or excessive fat – love that! What an interesting combination – shrimp and pumpkin – I would have never thunk it, but why not? And does it ever look delicious too. Your little peas floating in the heavenly curry sauce look so happy ;-). Love the little cayenne kick too here – this recipe is right up my alley Sally! Hope you try it and enjoy it too, Kelly! Sounds like a great way to use the last of my pumpkin puree. The frosty pumpkin struesel bars were amazing (sweet coconut and caramel etc) but I need to avoid all those sweets. 🙂 If you get tempted, here’s the post with the recipe etc. I like the asparagus idea! 🙂 The kids will eat that too. This is a great curry, Sally, and even better it it helps to clear the freezer of some of that pumpkin puree that seems to have just re-appeared out of nowhere. I do like all of your changes, too. The dish needs some color, like green, to brighten and offer contrast. Peas are perfect for the job. Is it fate that Libby’s Pumpkin Puree in the 15 oz. can just went on sale at my local market for $.99 cents? I usually stock up on canned pumpkin after the holidays so I can make our favorite pumpkin roll throughout the year. I’m on my third batch of this wonderful recipe Sally. Thanks so much for posting this! I’m heading back to the store to buy ten more bucks worth of canned pumpkin. Very creamy, and not too heavy. Lends itself to the addition of other greens like spinach, green beans, etc.